The Cobra Ladies Fly-Z hybrids are made to improve and optimize your long game by being fully adjustable and easy to hit. They feature Cobra’s Speed Channel Face, Forged E9 Zone Face Weighting and Crown Zone Weighting to deliver forgiveness while maximizing ball speed. 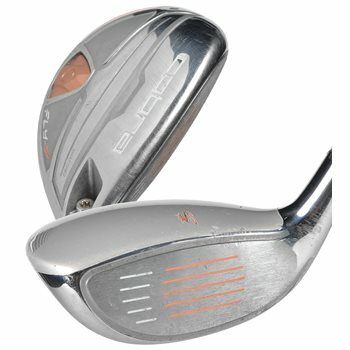 They are designed with a fixed, low and back CG location to deliver a higher launch and more forgiveness. They also feature the MyFly8 with SmartPad system that allows custom loft and trajectory settings ranging from 23.5°-26.5° in the 4-5 hybrid and 26.5°-29.5° in the 5-6 hybrid.